Richard SISSON [Parents] 1 was born in 1607/1608 in Of, Portsmouth, Newport, Ri. He was christened in Of Portsmouth, Newport, Ri. He died on 26 Feb 1684 in Portsmouth, Newport, R I. He was buried in 1684 in , , Rhode Island. He married Mary FREEMAN in 1644 in Massachusetts. Mary FREEMAN 1 was born in 1610 in Of, Dartmouth, Bristol, Mass. She died on 22 Sep 1692 in Dartmouth, Bristol, Massachusetts. She married Richard SISSON in 1644 in Massachusetts. F i Anne SISSIONS was born in 1647/1648. She died on 13 Jan 1713. F ii Elizabeth SISSON 1 was born on 8 Apr 1650 in , Dartmouth, Bristol, Mass. She died in 1740. F iii Anne SISSON 1 was born in 1660 in Dartmouth, Bristol, Mass. She died in 1713. M iv Anne SISSON 1 was born about 1646 in Of Dartmouth, Bristol, Massachusetts. He died after 1713. F v Mary SISSON 1 was born in 1653 in Portsmouth, Newport, Ri. She died in 1674 in Portsmouth, Newport, Ri. M vi George SISSON 1 was born on 17 Jul 1636 in Dartmouth, Bristol, Mass. He died on 10 Sep 1718 in Portsmouth, Newport, Ri. He was buried in Portsmouth, Newport, Rhoade Island. M vii James SISSON 1 was born on 8 Apr 1656 in Dartmouth, Bristol, Mass. He died on 15 Jun 1734 in Dartmouth, Bristol, Mass..
F viii Eliza (Or) Elizabeth SISSON 1 was born on 8 Apr 1650 in Dartmouth, Bristol, Mass. She died in 1740 in Portsmouth, Newport, Ri. F ix Mary SISSON 1 was born on 24 Jun 1639 in Dartmouth, Bristol, Mass. She died in 1674 in Dartmouth, Bristol, Ma. M x John SISSON 1 was born in 1658 in Dartmouth, Bristol, Mass. He died in 1687 in Newport, Newport, Ri. M xi James SISSON 1 was born on 8 Apr 1650 in Dartmouth, Bristol, England. He died in 1734. George SISSON 1 was born about 1588 in Of Yorks, England. He died in , , England. He was buried in , , England. He married George (Mrs) SISSON about 1607 in , , England. George (Mrs) SISSON 1 was born about 1588 in Of Yorks, England. She died in , , England. She was buried in , , England. She married George SISSON about 1607 in , , England. M i Richard SISSON was born in 1607/1608. He died on 26 Feb 1684. Glen C. GOODFELLOW [Parents] was born on 26 Sep 1897. He died on 4 Jun 1961 in Baldwinsville, Onondaga County, NY. He was buried in Jun 1961 in Riverview Cemetery, Baldwinsville, NY. He married Blanche LAVOY on 2 Apr 1921 in Syracuse, NY. Blanche LAVOY was born on 24 Sep 1897 in Manlius, Onondaga County, NY. She married Glen C. GOODFELLOW on 2 Apr 1921 in Syracuse, NY. Glen C. GOODFELLOW [Parents] was born on 26 Sep 1897. He died on 4 Jun 1961 in Baldwinsville, Onondaga County, NY. He was buried in Jun 1961 in Riverview Cemetery, Baldwinsville, NY. He married May Elizabeth HENCLE on 5 Jul 1920 in Hencle Farm, Cross Lake, Plainville, NY. May Elizabeth HENCLE was born on 5 Jul 1903 in Lysander, Onondaga County, NY. She died on 30 Aug 1992 in Baldwinsville, Onondaga County, NY. She was buried on 2 Sep 1992 in Riverview Cemetery, Baldwinsville, NY. She married Glen C. GOODFELLOW on 5 Jul 1920 in Hencle Farm, Cross Lake, Plainville, NY. M i Glenn Douglas GOODFELLOW was born on 4 Jun 1921 in Manlius, Onondaga County, NY. He died on 4 Apr 1995. Lester BROWNELL.Lester married Florence SEAGFRIED. Florence SEAGFRIED.Florence married Lester BROWNELL. Henry BONNELL [Parents] was born on 28 Nov 1767 in Morris County, NJ. He died on 28 Aug 1829 in Wayne County, NY. He married Elizabeth SIMCOCK on 22 Apr 1795 in Mendham, Morris County, NJ. Elizabeth SIMCOCK was born on 27 Apr 1775 in Mendham, Morris County, NJ. She died on 17 Mar 1848 in Wayne County, NY. She married Henry BONNELL on 22 Apr 1795 in Mendham, Morris County, NJ. F i Mary BONNELL was born about 1795. She died on 29 Jul 1849. M ii F. Charles BONNELL was born on 2 Nov 1801. M iii Henry BONNELL was born on 14 Jan 1807 in Waterloo, Seneca, NY. He died in 1894. M iv Jacob BONNELL was born on 3 Apr 1814 in Junius, Seneca, NY. He died on 7 Oct 1887 in Crawford Avalanch, Crawford. Jacob BONNELL.Jacob married Mary SCHOOLEY. Mary SCHOOLEY.Mary married Jacob BONNELL. M i Henry BONNELL was born on 28 Nov 1767. He died on 28 Aug 1829. Jesse C. SYRON [Parents] was born in 1877 in NY. He died on 17 Jan 1919. He married Edith SYRON. Edith SYRON was born in 1876 in NY. She married Jesse C. SYRON. M i Kenneth B. SYRON was born in 1901. He died in 1962. 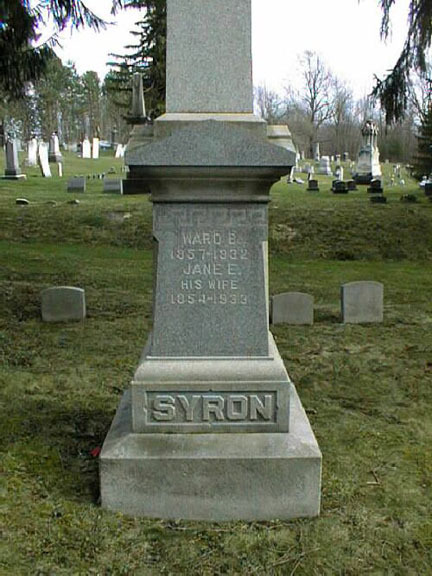 Ward B. SYRON [Parents] [image] was born in 1857 in NY. He died in 1932. He married Jane E. in 1884. Jane E. was born in 1854 in NY. She died in 1933. She married Ward B. SYRON in 1884. M i Roy S. SYRON was born in 1885 in NY. F ii Louise J. SYRON was born in 1891 in NY. Scott AMES was born on 9 Jul 1855 in MI. He married Anna Elmyra SYRON in 1890. Anna Elmyra SYRON [Parents] was born on 2 Jan 1867 in NY. She died on 23 Mar 1945 in Scottville, Mason, MI. She married Scott AMES in 1890. F i Fannie E. AMES was born on 16 Jun 1892 in Custer, Mason, MI. F ii Annetie AMES was born on 30 Apr 1895 in Custer, Mason, MI. M iii Scott AMES was born on 3 May 1898 in Custer, Mason, MI. F iv Anna Elmira AMES was born on 5 Aug 1900 in Custer, Mason, MI. F v Ella AMES was born on 24 May 1903 in Custer, Mason, MI.